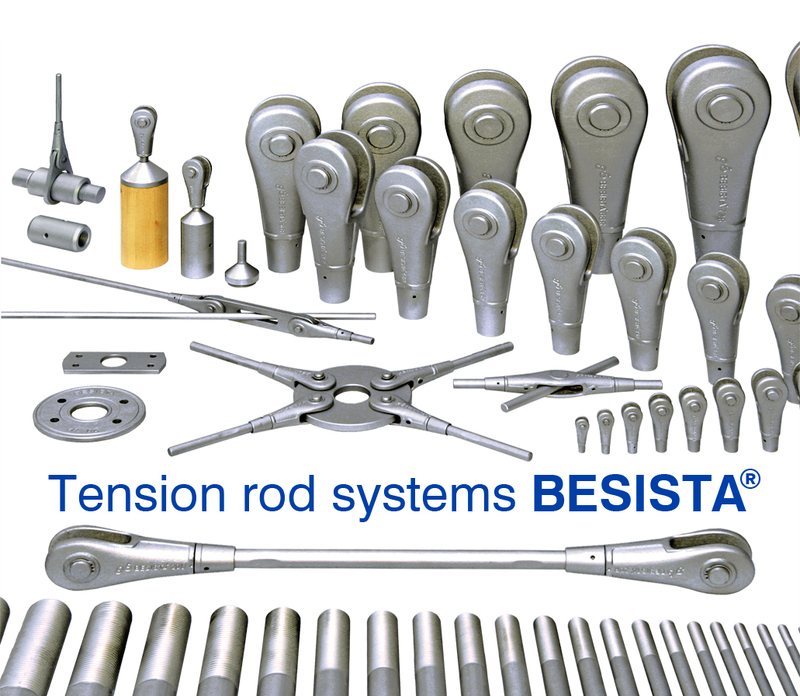 BESISTA® is your international expert and partner for innovative tension rod systems and compression strut systems. Apart from rod systems, we also manufacture other tension bars with left- or right-handed threads for architectural and civil engineering applications, always to the impeccable standards of quality and reliability that are BESISTA®'s hallmark. BESISTA® can show as the only manufacturer of tension rod systems a duration of use more than 32 years. We are your competent, international expert and partner for innovative tension rod systems and compression strut systems. Apart from rod systems, we also manufacture other tension bars with left- or right-handed threads for architectural and civil engineering applications, always to the impeccable standards of quality and reliability that are BESISTA®'s hallmark. For more than 32 years, the world's first tension rod system / tension bar system and compression strut system, invented by architect and engineer Dr.-Ing. Anton-Peter Betschart, have stood as the epitome of innovation, safety and supreme quality. The popular design features of the BESISTA® rod systems, featuring filigree rod components and organically flowing transitions, create an engaging formal language for inspirational solutions in architecture, steelwork, timberwork, facade construction, bridge engineering, for refurbishments and civil engineering, or for compression struts. In line with their function, the castings that anchor the tension bars to the gusset plate were christened "rod anchors" by Betschart. Unlike conventional tension bars, his system is not tensioned by nuts but by turning the tension bars, each of which is provided with one left-hand and one right-hand thread. Given that tension rod systems / tension bar systems or compression strut systems are safety-critical components, the fully illustrated, easy-to-understand installation instructions need to be closely observed at all times. Even the latest heavy-duty designer tension rod systems / tension bar systems – BESISTA® 2-540 – are subject to continuous refinement, thereby underlining the age-old wisdom that "You can't beat the original". Yet, all the time, safety aspects enjoy the utmost priority, with safety margins far surpassing the minimum permissible values. Particular highlights include the durable zinc coat on the threads of the hot-dip galvanized tension bars and the high-performance pretensioning systems for controlled pretensioning of the tension bar systems. For improved material efficiency, BESISTA® supplies the tension bar systems in 24 finely incremented sizes from M8 to M76. Even though the castings, tension bars and compression struts are manufactured in Germany, Switzerland and Sweden, maximum cost effectiveness is guaranteed. The latest innovations include compression rod connections for steel and timber compression struts, cross plates for extremely flat angles and cross anchors for the contact-free crossing of tension rods. BESISTA®'s pioneering role in performance, sustainability and design appeal has been duly recognized by the grant of various patents and awards. All these benefits have earned BESISTA® a global reputation, its credentials underlined by the use of its tension rod systems / tension bar systems since 32 years on a string of prestigious and architecturally challenging schemes in various countries, e.g. the spectacular Metropol Parasol in Seville (Spain), the Estadio de Bata stadium (Equatorial Guinea), the world's first timber high-bay warehouse in Kleinheubach (Germany) or – more recently – the Sochi Olympic Stadium (Russia) and in the Skywalks in Lipno (Czech Republic) or on the island of Rügen (Germany). In addition to the manufacture of tension rod systems / tension bar systems, BESISTA® also leverages its in-depth expertise and flexibility in the bespoke fabrication of threaded tension bars for other architectural and civil engineering applications. The company has reaped all the benefits of being at the cutting edge of technology: its products offer supreme design sophistication, maximum safety and absolute reliability.